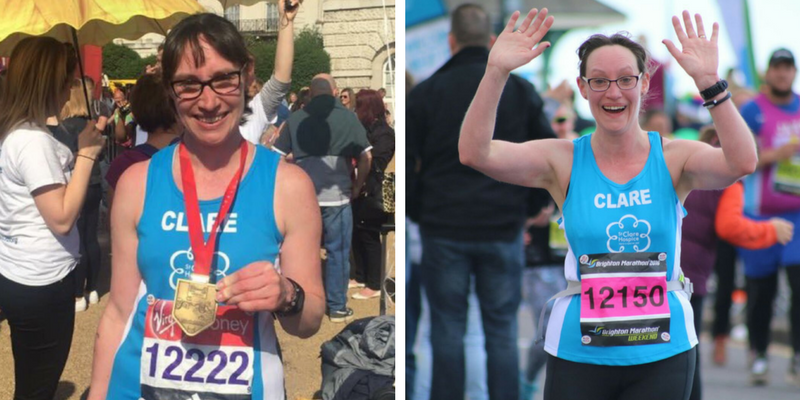 St Clare supporter and seasoned runner, Clare Gallagher, shares tips and tricks on running the London Marathon! The London Marathon is an amazing and life-changing event. Trust in your training. All the hours and miles have led to this! In 2017, I was lucky enough to receive a ballot place for the London Marathon. I had entered the ballot in May 2016, thinking I wouldn’t get a place. I put it to the back of my mind – that was until I received the ‘Congratulations’ magazine! Realising how lucky I was, I decided to use my marathon to raise money for St Clare Hospice, in gratitude for how they had looked after my little Nan until she passed away in April 2015. Training for a marathon is time consuming and hard work, but all of the training is worth it. The cold nights and rainy Sunday runs are all leading you towards that one day: the London Marathon. I have put together a few tips to help you with your training and pointers for the day! Try not to run the same route again and again. Running ‘buddies’ are a God-send – if you can join a club or if you know any other people running a marathon in the spring, then see if you can do your longer runs together; 16 miles on your own can be a long way! I found that recording my runs on an application called Strava really helped, because I could track the miles I was running and see myself improving. Trust your body; you will be able to feel a ‘niggle,’ and you will know if something isn’t right. Sometimes you need to rest or slow down and give yourself a little time to recover. If you train too hard, you will break! I couldn’t run on a Monday or Tuesday evening because I have children and I work full-time, so I have to work around it. Training plans are great; they work and can give you a great guideline for where you should be in your training. You should also be able to adapt the plan to work for you. Last year, I ran Silverstone Half, which was a London Marathon event. It will give you a feel for what race day will be like. Running in a crowd of people is different to running on your own. It will also enable you to familiarise yourself with how the feed stations work and things like that – and also how it feels to finish a race and celebrate afterwards! It’s a great feeling crossing that finish line and realising you’ve completed the race. Pilates and swimming will build your core and help prevent injuries. For me, my right hamstring was causing me a bit of an issue, but once I worked on my core strength, the ‘niggle’ went away. I used a combination of High5 gels, Shot Bloks and Jelly Babies. You need to find what works for you and carry it with you on the day! The bus took me close to the start area and I didn’t have to worry about public transport to get me there. I was just delivered. You want to have completed a longer run in the clothes you are going to wear. You don’t want to find at mile 18 that your t-shirt is rubbing, or your trainers are causing you problems. Go when you arrive and before you get into your starting pen! You will be standing around before you start and it can be cold. It can take you a while to cross the start line – for me it was around 30 minutes! The jumper can then be thrown to the side as you go towards the Start, because they are collected by the volunteers and donated to charity. When approaching the water stations, you will find that people will slow down which can cause a bottle-neck of runners. There will be people in all sorts of wonderful fancy-dress, and all sorts of paces running together. I found out quite quickly that my pace would fluctuate due to the people running around me. London, for me, was a marathon to enjoy – not to aim for a finishing time. This was very important to me, as my children were on the route and I wanted to make sure that I would see them. It also kept me going. I knew I would see them at Mile 16, and I enjoyed running towards it knowing they would be there to see me. Especially near the water stations they will be all over the road. The London Marathon is an amazing and life-changing event. Trust in your training. All of the hours and miles have led to this. Make sure you look around and take in the atmosphere. I would like to wish you the very best of luck. You are raising money for such a fantastic charity, and I promise you that running the marathon will be one of the most amazing things you will ever do. Clare Gallagher is a supporter of St Clare Hospice, inspired to run and raise vital funding for the charity after her beloved Grandmother passed away in our care in March 2015. Clare completed 13 races in aid of St Clare in 2017, covering over 160 race miles and over 500 training miles in that year alone. Clare continues to support the Hospice and has raised thousands of pounds to go towards funding our compassionate care in the local community.